ForensicsCenter Custom Built Computer - Tracer Technologies Inc.
Tracer Technologies has been on the leading edge of Audio Forensics since its inception. 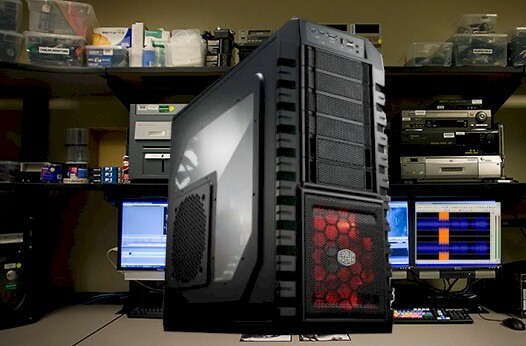 Our experience training and educating Forensics professionals all over the world has helped shape our new ForensicsCenter Custom Built Computer. Each element of this custom PC has been evaluated for speed, accuracy and security. You simply won't find a better solution as the centerpiece of your Forensics Lab. It is unbelievably fast using the elite Intel I7-980X overclockable 6 core processor. One TB drive simply unplugs from the front of the computer for quick swapping or to put in a safe. Four other 1 TB drives are in a Directly Attached Storage cabinet with built in Raid backup = if a drive fails, it will immediately recover all the data. This is certainly, one of the fastest, safest and most secure systems on the market.